Scroll down to see the top not-for-profit colleges and universities in New Hampshire offering online degree programs. Southern New Hampshire University offers more than 200 online degrees at the associate, bachelor's and master's level. The university offers online degrees in broad categories including business, art and design, criminal justice, education, health care, information technology, math and science, and public administration. Many of the degrees provide students a wide choice of specialties. Candidates for the Master of Business Administration, for example, can choose from nearly 30 areas for a specialty. Online classes are offered in six nine-week sessions per year, giving students flexibility in when they start a program. Online students have access to support and resources including an academic adviser, career-development services, 24/7 technical support, online tutoring, and an online library. SNHU offers financial aid packages to qualified online students and provides tuition discounts for active-duty military personnel and their spouses. Online students pay the same flat-fee per credit hour no matter where they are located, with additional discounts for residents of Maine attending the Maine regional center. Online students also have access to SNHUConnect, which the college describes as a 'virtual student union' where students can interact with and collaborate with other students. Granite State College offers online associate, bachelor's and master's degrees, including degree completion programs for students who already have some college credit. Associate degrees are offered in general studies, business, communication sciences and disorders, behavioral science and early childhood education. Students seeking a bachelor's degree can choose from more than two dozen options, including accounting and finance, criminal justice, health and wellness, education, and individualized studies. Granite State's degree completion pathways allow a student who has already earned an associate degree to earn a bachelor's degree by completing 15 courses. The college also offers master's degrees in leadership, management, project management, and school leadership. Students can gain college credits for their life experiences in several ways, including passing standardized tests or submitting an experiential learning or competency-based training portfolio. Online students may qualify for financial aid. The college offers discounted software, IT support, and free online tutoring for online students. Granite State is authorized to provide online classes to residents of 36 states that are part of the National Council for State Authorization Reciprocity Agreements. Once you discover how many degrees New England College offers online, it's easy to see why online enrollment is about equal to the number of students on campus. At the undergrad level, online programs include associate and bachelor's degrees in 12 disciplines, but the offerings go deeper. Business administration majors can choose from 12 concentrations, for instance, and psychology majors from eight concentrations. NEC ranked No. 172 in Best Online Bachelor's Programs in the 2018 U.S. News rankings. Fewer graduate degrees are offered online, but they, too, have plenty of choice, with seven MBA concentrations and 13 majors for the Master of Education. Both the MBA and graduate education programs ranked around No. 150 on the U.S. News listings. Rivier University offers a variety of degree-completion and graduate degree programs through its online university. Options for undergrads include a bachelor's degree in psychology, business administration, or public health, as well as a RN to BSN option for working nurses. Rivier also offers an online Bachelor of Arts in Individualized Studies, which allows students to select the courses that meet their personal interests or career goals. Graduate degrees available online are all in the fields of business or health care. MBA candidates can select a concentration in information technology management, marketing, or management, or they can enter the specialized program for an MBA in Health Care Administration. Students seeking to combine leadership skills with health care can also earn a Master of Public Health online. Nurses can advance their career by earning a Master of Science in Nursing with a concentration in family nurse practitioner, leadership in health systems management, or nursing education. Rivier also has a clinically focused Doctor of Nursing Practice program available online. Most online courses run for seven weeks, although some nursing classes last 14 weeks. Rivier offers multiple start dates each year and has a rolling admissions policy. Franklin Pierce University's online programs are designed for adult learners who want to complete an associate degree or bachelor's degree. To add flexibility to the program, the college offers six terms per year, and students who live near the university can combine online courses and on-campus courses. The university also grants credit for prior learning and accepts credits from the Alternative Credit Project to speed the time to graduation. Online bachelor's degrees are mostly in the business field, including accounting, management, and marketing. Health care options include emergency medical services, RN to Bachelor of Science in Nursing, and health care administration. Franklin Pierce also has four associate degrees online. Plymouth State University offers a variety of graduate degree through Plymouth Online. Students enrolled in these courses have the convenience of 24/7 access to class materials and they benefit from the high amount of interaction and collaboration that results when they and their classmates work on online projects. The newest program Plymouth Online has introduced is the Master of Education in Online Instructional Design, a degree aimed at educators, trainers and others who want to create effective online learning programs. If they prefer, online students can earn a five-course graduate certificate and skip the master's core component of the program. PSU's online MBA program allows students to select a track in general management or in health care administration. The rolling admissions process allows students to begin the MBA program at the start of any term. Other online programs offered through Plymouth Online include a Master of Science in Accounting and Master of Education programs in curriculum and instruction, education technology integrator, library media specialist, or curriculum instruction, adult learning and development. The University of New Hampshire offers more than one hundred online undergraduate courses each semester that are on the same schedule as on-campus classes. The university also offers several graduate degrees and certificates online, however, courses for these programs typically follow a different schedule than on-campus offerings. The Peter T. Paul College of Business and Economics offers an online Master of Business Administration degree designed for full-time professionals that can be completed in two to six years. In the field of patent law, the university's School of Law and the Franklin Pierce Center for Intellectual Property offer two programs that can be pursued online on a part-time or full-time basis: a 30-credit Master of Intellectual Property (MIP) degree and a 24-credit Master of Laws (LLM) degree. The school has two additional programs offered exclusively online: Master of International Criminal Law and Justice (MICLJ) and an LLM in International Criminal Law and Justice. The following programs are also available online: Master of Education in Educational Studies, Master of Social Work (CSWE-accredited), and Doctor of Nursing Practice (DNP). Students accepted to the DNP program can earn up to 12 credits towards the degree based on their educational background and prior work experience. New Hampshire sponsors a surprising number of initiatives for distance learners. This short guide covers the most essential. We’ll demonstrate how to get an associate degree for $2,000, how to use consortium agreements to access more online courses, and how to easily transfer distance education courses to other schools. If you’re worried about enrolling at a quality school, we’ll explain how to check a school’s accreditation, too. 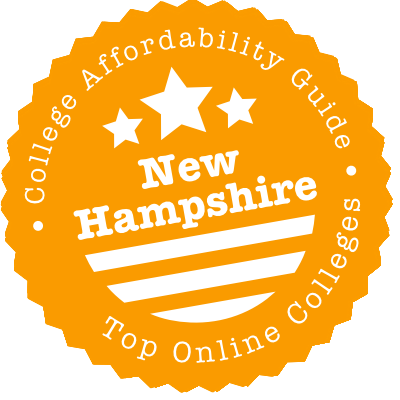 This guide will make choosing a New Hampshire online college a breeze! The Virtual Learning Academy (VLACS) was founded to give all New Hampshire high school students a chance to take specialized courses, regardless of whether their school district could afford to offer them. Through VLACS, all New Hampshire middle and secondary students can enroll for free to take Advanced Placement (AP) courses. Earn a high enough score on the ultimate exam and you’ll score free college credits at just about any postsecondary institution. VLACS also runs an early college program! Take individual courses or all 20 required courses and you’ll walk away with an associate degree in Liberal Arts from Southern New Hampshire University in addition to the high school credits you accumulate. SNHU courses cost a mere $100 a class (not per credit!) plus textbooks, meaning that for a couple of grand you could be halfway done with college before you finish high school. If you’re only looking for a few college credits and not an associate degree, you can opt instead for the eStart program, sponsored by VLACS in tandem with the Community College of System of New Hampshire (CCSNH). Tuition is slightly more expensive at $150 per class plus textbooks, but that doesn’t matter much if you prefer the coursework. Since we’re on the subject of community colleges, we should mention the New Hampshire Dual Admission Program. As the name implies, the program allows you to apply — and be admitted to — one of the seven state community colleges and a University System of New Hampshire school simultaneously. Just finish your associate degree and then be on your way to the university for a baccalaureate. Why do this? It makes transferring a lot easier because you’ll receive academic advising every step of the way that ensures you’re taking the right courses to graduate with a bachelor’s degree in four years. If you’re contemplating this or another transfer route, look to NH Transfer. It lists transfer programs, catalogs bilateral and multilateral transfer agreements, and powers a database for searching for transferable courses. You can even apply to transfer to a state school from CCSNH. The New Hampshire College & University Council (NHCUC) is a group of public and private colleges in the state that includes Colby-Sawyer College, Franklin Pierce University, Granite State College, Keene State College, New England College, New Hampshire Institute of Art, Plymouth State University, Rivier University, St. Anselm College, Southern New Hampshire University, and the University of New Hampshire. If you are a student at any of these schools, you’re eligible to take courses at other NHCUC institutions through its Student Exchange program. Pay tuition at your home school, take classes elsewhere, and get credit toward your degree. Several NHCUC colleges, such as Southern New Hampshire University, are big players online, so the Student Exchange program provides an alternative inroad to distance education. The New England Association of Schools and Colleges (NEASC) is the regional accreditor for New Hampshire’s degree-granting institutions. One benefit of going to a regionally accredited school as opposed to a nationally accredited one is that such schools often accept credits from each other. Peruse the list of NEASC-accredited schools in New Hampshire. If your chosen college is there, you’re off to a great start. Accreditation is great, but it’s extra nice to avoid schools who have trouble staying in compliance with NEASC. An asterisk next to a school indicates a recent action by the commission. These may notify the public that the school is falling short of the accreditor’s standards. There are no for-profit institutions in New Hampshire operating at the degree level, eliminating one of the most common sources of substandard degrees. However, schools in the state that only hand out certificates may seek national accreditation. If you happen to find a distance education certificate at such a school, check the CHEA directory of institutions to make sure it’s listed. According to its website, Calvary Chapel Bible College, which runs a distance learning program, chooses not to pursue accreditation. Therefore, the college is not listed in the CHEA database. New England Association of Schools and Colleges (NEASC): The regional accreditor for New Hampshire’s degree-granting institutions, NEASC maintains a list of accredited colleges and regularly informs the public when one is sanctioned. Community College System of New Hampshire (CCSNH): Through the CCSNH eStart program, high school students can accumulate college credits at a low price while also fulfilling high school graduation requirements. New England Board of Higher Education (NEBHE): NEBHE’s Tuition Break initiative gives Granite Staters a discount on eligible programs not available at a New Hampshire public university. Tuition Break focuses on residential programs, with only one approved online program in 2017-18, but that may change in subsequent years. New Hampshire College & University Council (NHCUC): Students at NHCUC institutions can join its Student Exchange program to take classes at other NHCUC member schools. New Hampshire Dual Admission Program: Enroll at a New Hampshire community college and a state school in one fell swoop to streamline the transfer process. NH Transfer: NH Transfer is your guide to mapping out a transfer, ensuring you take courses that will count at your eventual destination. Community college enrollees can also use NH Transfer to apply to a University System of New Hampshire school. Virtual Learning Academy (VLACS): Find free high school and dual credit courses online. VLACS also has an adult ed program for nontraditional learners looking to earn their high school degree.